221 Items. Showing Items 106 thru 120. The largest size clutches available for over sized earrings. They work best on heavy or large earrings that need stabilization. Available in sterling silver or 14k yellow gold filled. Sold by the pair or in packages of 5 pairs. The largest size clutches available for over sized earrings. They work best on heavy or large earrings that need stabilization. Available in 18k rose, 18k yellow or 18k white gold. The largest size clutches available for over sized earrings. They work best on heavy or large earrings that need stabilization. Available in 14k yellow, 14k white gold or 14k rose gold. Large size clutches for over sized earrings and thick posts. They work best on earrings that have larger sized posts or for heavy earrings that need stabilization. Available in 14k yellow or 14k white gold in 3 sizes. Standard size clutches fit most all earrings. They are used universally on both small and medium sized posts. Sold in packages of 5 pairs. 4mm ball style screw back earrings for non pierced ears. The open ended loop makes it easy to attach your dangle creations of bead or gemstones. 4mm ball style screw back earrings for non pierced ears. The open ended loop makes it easy to attach your dangle creations of bead or gemstones. Available in sterling silver or 14k yellow gold filled. 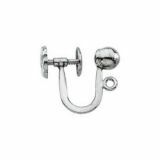 Ball end style ear wires for custom earring designs. The open ended loop makes it easy to interchange your dangle creations of bead or gemstones. Ball end style ear wires for custom earring designs. The open ended loop makes it easy to interchange your dangle creations of bead or gemstones. Available in 14k yellow and 14k white gold.